Officers on a Canadian navy ship looking for illegal contraband off the coast of Central America instead found themselves rescuing a trapped sea turtle. HMCS Nanaimo was on patrol in the eastern Pacific Ocean for Operation Caribbe, a U.S.-led effort to put a halt to drug trafficking. A lookout on the vessel spotted something suspicious in the water and when the boat got closer, determined it was a fishing buoy. A commanding officer decided to investigate the buoy for contraband but wound up finding a sea turtle with one of its flippers tangled in the buoy. 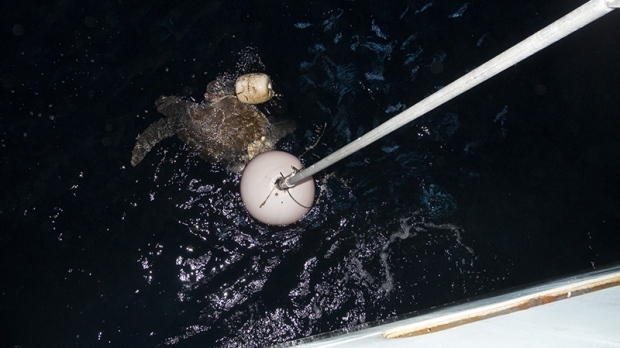 Unable to free the turtle from the ship, the crew launched an inflatable boat to get up close with the animal. A boatswain from HMCS Nanaimo quickly pulled up the buoy and freed the turtle, which swam away. The buoy did not hold any illegal contraband. 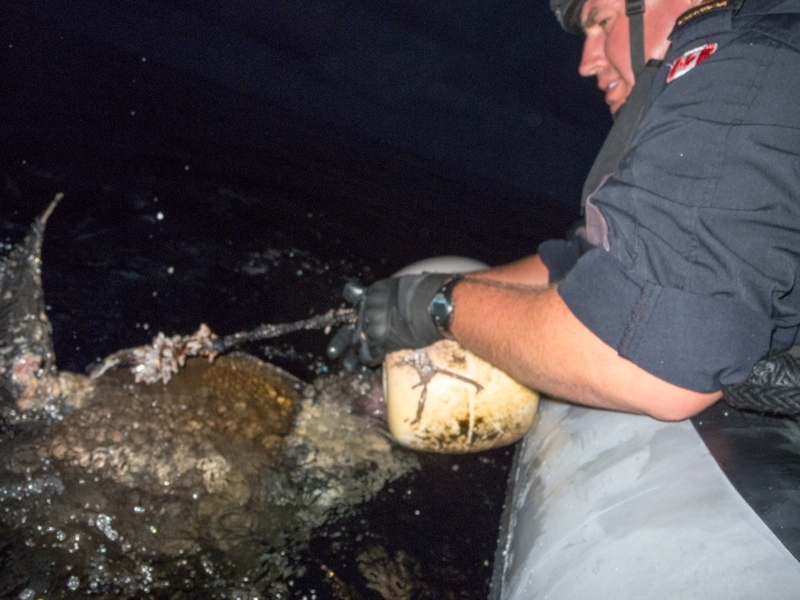 "The Royal Canadian Navy has a reputation for rescuing sea turtles during Op CARIBBE and I didn’t want to miss out on the opportunity on this deployment," Lt.-Cmdr. Jason Bergen, Commanding Officer of HMCS Nanaimo, said in a statement. "I also wanted to check the buoy for contraband and knew one of the Boatswains needed to act as a Boat Coxswain to complete his training package, so it turned out to be a win-win for everyone." The boatswain, who cannot be named due to privacy reasons, said despite not finding contraband he was still satisfied with the rescue mission. "Some days we help keep drugs off the street, some days we help turtles, the best days we get to do both," they said. Other Canadian naval vessels including HMCS Edmonton and HMCS Moncton are currently deployed on Operation Caribbe.